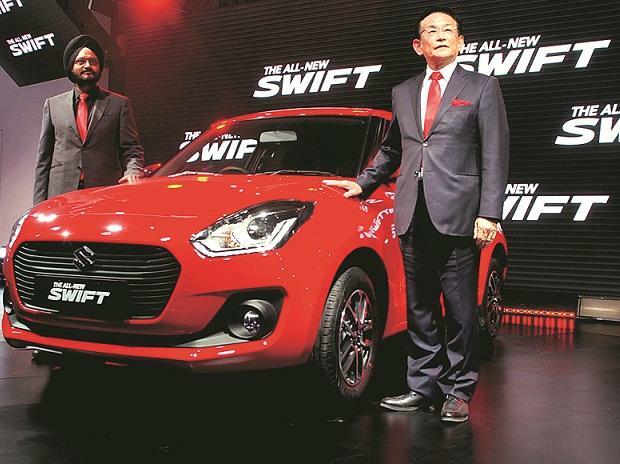 Maruti Suzuki, the country's biggest carmaker, launched the third generation of its bestseller compact car, Swift, at Auto Expo 2018. The entry price of the new Swift is Rs 499,000 (ex showroom, Delhi) for the petrol variant. The diesel variant begins at Rs 599,000 and goes up to Rs 796,000. The new Swift has been developed with an investment of Rs 7 billion. "This is the brand that has redefined the Indian automobile industry. Swift was launched in India in 2005 and, since then, it has created a glorious legacy of its own. Buyers loved the car for its sporty stance, bold attitude and exciting performance," said Kenichi Ayukawa, managing director and chief executive officer. The second generation of Swift was launched in 2011. Swift has been among India's top 5 best-selling cars for more than a decade and has done cumulative sales of over 1.8 million units since 2005. For the first time, Swift offers auto gear shift technology for the convenience of customers. Built on Suzuki's fifth-generation HEARTECT platform, the all-new Swift has a superior power-to-weight ratio and comes with improved acceleration performance. This platform gets more strength and rigidity, and leads to a peppy and fun to drive experience, the company said. The new Swift is more aerodynamic, wider and has a longer wheelbase, making it more spacious. It has been created to offer a superior ride, handling, and drivability. The company expects customers to appreciate the superior fuel efficiency of the all-new Swift. The car claims to offer enhanced fuel efficiency for both the engine options — 22km per litre for petrol and 28.4km per litre for diesel. The hatchback comes with around 98 per cent localisation, truly embodying the 'Make in India' vision. The company said the new car will have lower emissions. Dual airbags, ABS (Anti-skid braking system), EBD (Electronic brakeforce distribution), and ISOFIX are standard features, and the new Swift meets the advanced safety norms ahead of schedule.